These are the areas that are offered for tours. Each one takes about ½ hour to experience. The 20 minute documentary is offered free at the farm with 3 other areas booked or the 50 minute one is free with 5 other areas booked. The guide may purchase either the 20 or 50 minute one and show it on the motor coach. Cookies and drinks are served with each tour. In the documentary you will learn about Emil’s service as a "dollar a year man" during World War I, and how he transformed 8 farms in north central Iowa into grand operations between 1915 and 1940. 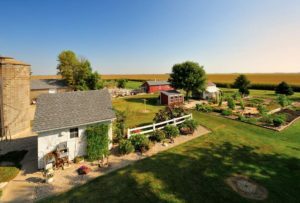 These farms provided employment to many locals during The Great Depression, serving as just one example of Col Tyden's kindness throughout his many endeavors. One of those farms, Tyden Farm No. 6, stands today as it did in 1936. It is now a district listed on the National Register of Historic Places. 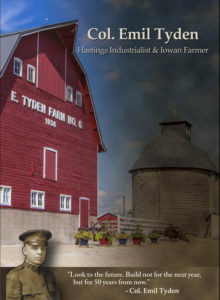 The documentary includes old home movie film of farming activities on the farms and the grand opening of Tyden Feed Store recorded by Emil’s son-in-law Richard A. Groos with a 16MM movie camera. There is also video of the manufacturing of the seal and sprinkler. All the video was provided by the decedents of Emil. The bedroom set Emil sent out from Hastings is also shown in the documentary. In the 20 minute documentary those of you from Iowa you may recognize the voice of Lee Kline, a well-known farm radio announcer on WHO in Des Moines since the 50’s. He is Judy’s cousin and did this to support preserving farming history. This documentary is available for purchase at our Gift Shop, for a short preview CLICK HERE. Step back in time in the hog house/farrowing house built in 1941 transformed into a climate controlled museum filled with treasures mainly from the 1940’s and 1950’s with a handicapped accessible bathroom! 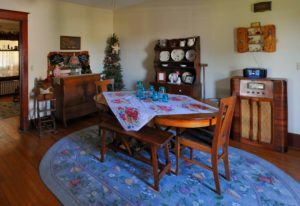 Enjoy the farm family museum with a power point tour of the Sears house and furnishings, plus much more. Did we mention it is in a remodeled hog house that is a climate controlled museum including air conditioning? Come and see the attractively arranged areas and collections. There are kitchen, living room, bedroom and laundry areas; as well as a school room area with Judy’s 1st grade books. The museum also houses collections of medicines from the day, jewelry, hair care items, WWI and WWII uniforms, children’s books, cosmetics, Christmas—including an antique nativity that belonged to Judy’s parents—and other holiday items and SO much more. Most of the items have family tie-ins and stories to be told about them. A small desk on display was made for Judy’s brother by her grandmother, using peach crates. 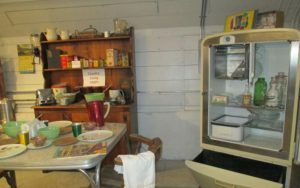 A great deal of love and imagination have been blended to create a very enjoyable museum of family living in the 40’s and 50’s. Along with preserving the old farming we offer a half hour visit on modern farming. We farm around 3000 acres with two of our sons. 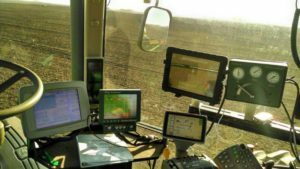 We use modern technology such as GPS, vertical tillage and computers in the combine and tractors. We have welcomed a group of people from across America wanting to understand modern farming and a group of Ukrainians wanting information on how they can improve their soils to grow better crops. For this we try to have both of our boys and Ted visit with the group about modern farming. Because we are a working farm it depends on the timing if we can get all three men there. We will also try to bring out some of the machinery that is available. For groups of 30 or more. After buying No. 6 Col. Tyden proceeded to build it up as he had the previous farms. In 1936 he had the barn 140’X40’X45’, concrete corn crib, 3 stall garage/shop and a machine shed built. It is no wonder the evening entertainment was to drive around and see what was happening on the Tyden farms. You will see the inside of these impressive buildings and how they worked. Find out how many bails the awe-inspiring hay loft can hold. The concrete corncrib stands 60’ tall and you get a feeling of the size when you step into the bin areas and look up to the top timbers. Also understand the extensive water system used to get water to the cattle. Many of the pieces of antique equipment are like what was used to farm the Tyden farms. A couple of them are a John Deere 999 two row horse drawn planter and a John Deere corn binder. They were owned by Henry Ducommun of Cleghorn, Iowa and were purchased at his farm auction 2011. The planter came ready to go with seed corn in the planter boxes. 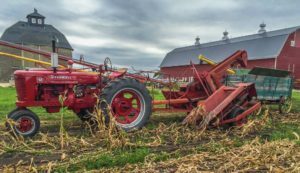 Along with equipment there are tractors like Emil owned, hit and miss motors, a one of a kind hay rake and many more examples with local history. Judy’s gardens are beautiful, charming, whimsical and fun! Discover why different areas became gardens, the story behind the lime patio with heart and the hard water fountain along with other interesting stories. Visitors will be surprised and delighted at the different ideas and the ways they have been carried out. There is the old time saying areas with each saying exhibited with flowers, machinery and structures. You may even get some ideas on short cuts in your own gardens. With no fans or air conditioning available, some families had what was called a Summer Kitchen. On the tour you will see how they kept the summer kitchen cool, why it was built where it was, and the many things that would be done there. There is a wood stove Ted ate cookies that had been baked in, pots and pans, canning equipment and much more. Step back into one and experience the smells and tastes of by gone times. 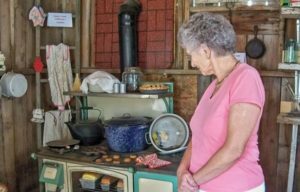 The descendants of the family that built the house have shared some of the stories about the house and on your tour you will hear some of them along with some of Ted and Judy’s. Find out how many doors are in the house and the reasoning behind the one that doesn’t have one. Emil’s room is set up with the furniture he sent out from Hastings for when he would come out to visit and catch up on the farms. The house also has more family heirlooms from Ted and Judy’s families.